2006-2009 were great, the forum was very active and I loved posting and gaining reputation (whatever happened to that?). I eventually got banned, IP banned and put on the auto-ban list. Looking back, very immature and no idea why I ever trolled the forum lol. It's kinda sad how dead it is now. I vaguely remember you campaigning to remove a certain piece of furniture from the 'rares' pool, way back in the day @-:Undertaker:- ,what was that? eerm, only because i remember it the most and being really active in the helpdesk (kelly/absently did some pretty cool events in there) 2014. 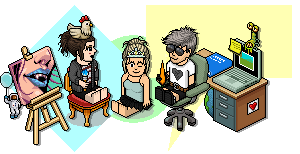 - My first year at Habbox as staff!